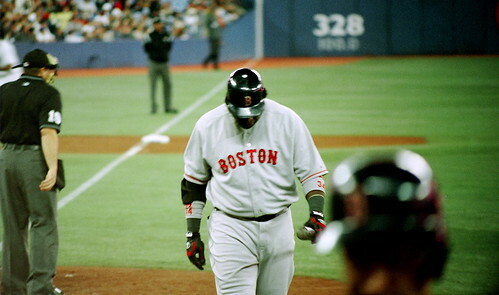 Sobby Big Papi, originally uploaded by frigante. For the entirety of this young season, I’ve been cramming friends and family alike full of meaningless, reassuring pablum. Ortiz was fine, really. Too good of a hitter for this to last. Even the great ones go through it. And so on. Which of course I still believe. But I’ve progressed from stage 1 concern to stage 2 worry. Not because of the slump. Great hitters do indeed go through similar slumps. Because of what it might be causing the slump. Just like Chad. It was only within the past few days thay I heard the word “limping.” When that applies to my own poor cracked and split feet, that’s an unfortunate word. When it’s used in conjunction with David Ortiz’ surgically repaired knee, well, it’s frankly terrifying. Worse, the always unimpressive Buck/McCarver tandem related a troubling anecdote during Saturday’s telecast concerning Ortiz’ mental state. Apparently Tito had to pull Ortiz aside to tell the Smiling One that his lack of smiles was affecting the rest of the clubhouse. When was the last time anyone had to tell Ortiz to smile? Let alone to take a night off? To be sure, I don’t believe, I know that Papi will come out of this. Probably soon. But I am worried about the aftereffects of what I believed to be a fairly routine procedure on his knee. Not least because players of his type don’t tend to age well. We need Papi to be Papi. And I’m sure that he will. But I am now on Alert Level Orange. Or is that Red? I was sitting down near the Sox dugout in Oakland and Papi was definitely hobbled as he walked off the field. Troubling. Also, it takes the likes of Miller/Morgan to make me appreciate McCarver/Buck — they're all so banal. @ahl: indeed, and Olney said this morning that a scout said Ortiz' bat "looked slow." he'll be fine, but i am worried. as for mccarver/buck, well, i hate the former with the white hot intensity of a thousand suns and as for the latter, well, he's a bit too smarmy for me. morgan is terrible and miller overrated, but at least they're not mccarver.